Management suite and Kuando Busylight UC. 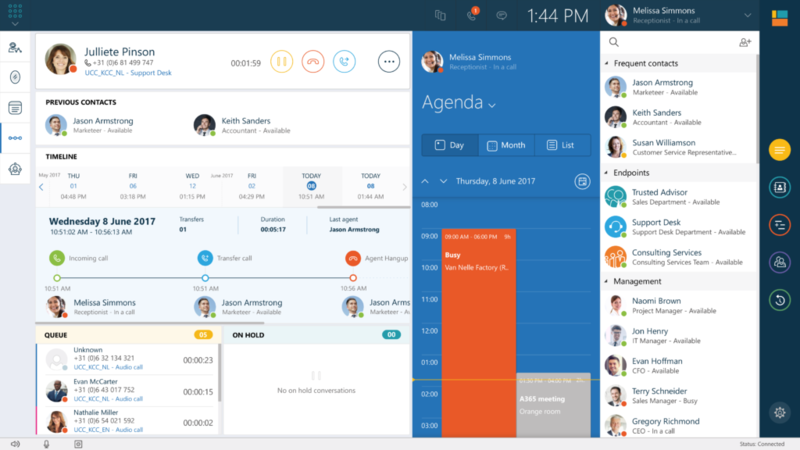 The Anywhere365 Reception Attendant is a rich client-side or web-based application for manually handling calls by a reception desk. 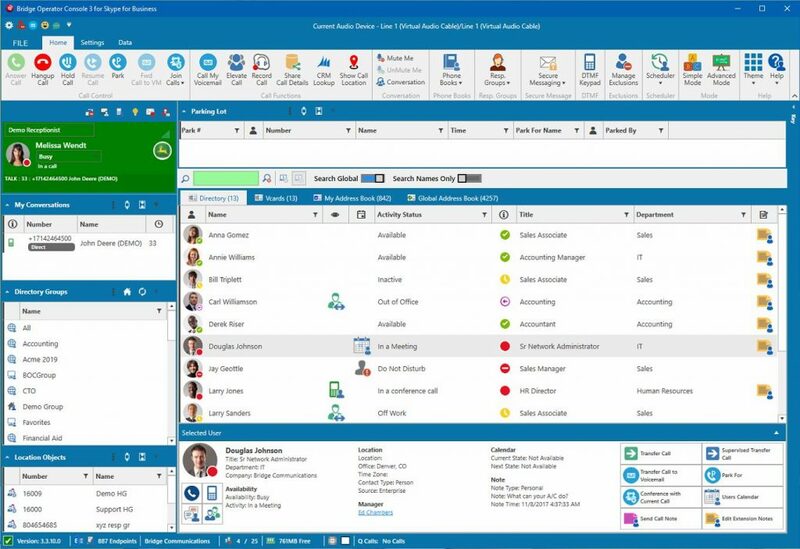 Apart from powerful features as call history, calendar integration, one touch transfer, queue management etc., it can also be seamlessly connected to an Anywhere365 Universal Contact Center (UCC), thereby enabling full contact center and dialogue management capabilities such as including the calls of the reception in Anywhere365’s advanced reporting, call recording, multi-receptionist queue handling, IVR, bots, etc. 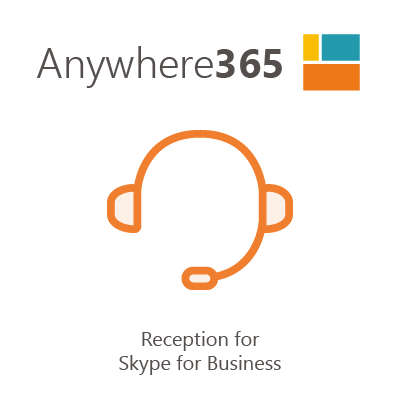 Anywhere365 is native to Skype for Business and seamlessly integrated within the Microsoft ecosystem of products. This plug & play interoperability is provided by Workstreampeople. Kuando Busylight is only responsible for the hardware. 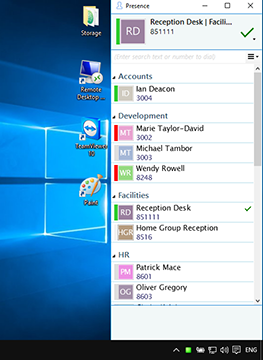 Please contact Workstreampeople if you have any questions about the software and whether your version of the Skype for Business Reception Attendant of the Anywhere365 Dialogue Management is compatible with Busylight. 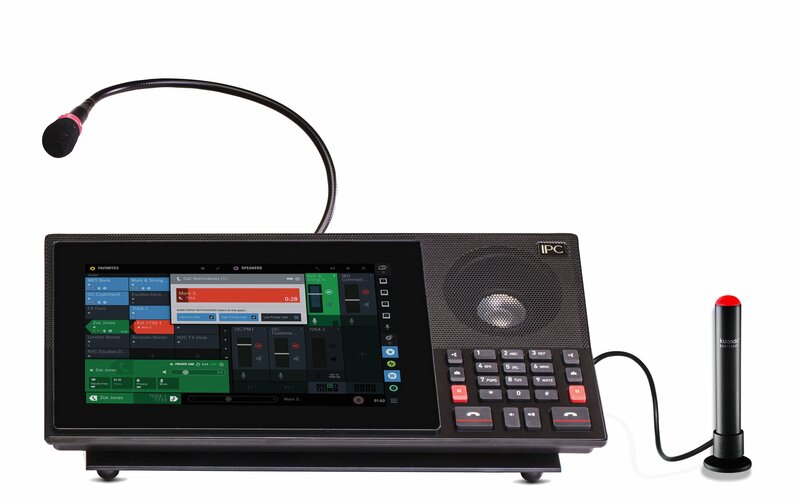 Bridge Communications, proud to offer the Bridge Operator Console with kuando Busylight UC support. Bridge Communications is the developer of the Bridge Operator Console for both Microsoft Skype for Business (Lync) and Cisco CUCM solutions. 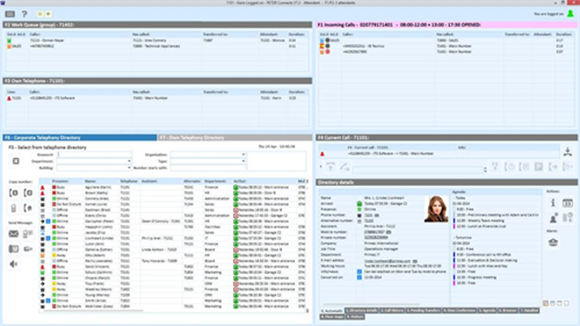 The Bridge Operator Console software provides powerful, affordable and scalable call handling solutions. 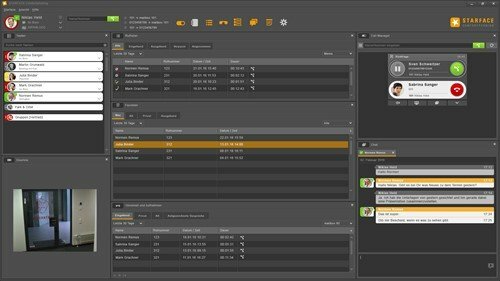 Bridge Operator Console solutions are designed to help get the most out of your UC investment. The Bridge Operator Console is the only attendant console to have passed the highest level of certification on Cisco Unified Communications and Microsoft Skype for Business. Using a certified solution ensures the highest level of quality, and continued support from your platform provider. 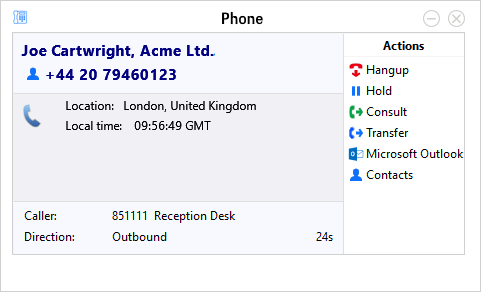 Provides visible status of phone state for receptionists and other users of the Bridge Operator Console. This plug & play interoperability is provided by Bridge Communications. Kuando Busylight is only responsible for the hardware. Please contact Bridge Communications if you have any questions about the software and whether your version of the Bridge Operator Console is compatible with Busylight. planet 33 AG has implemented interoperability between the Swyx Softphone and Kuando Busylight UC. It is a handy add-on for the Swyx Client. Everyone in the office can see, whether a call comes in, the colleague is available, does not want to be disturbed, or is on the phone. The software is distributed as freeware bundled with Kuando Busylight UC. Please contact planet 33 for a quote. This software solution is provided by planet 33 AG. Kuando Busylight is only responsible for the hardware. Please contact planet 33 AG if you have any questions about the software and whether your version of Swyx is compatible with Busylight. systel develops communications solutions and is an official partner of Alcatel-Lucent. systel has implemented plug’n’play interoperability between their communications tool click2dial and Kuando Busylight UC. 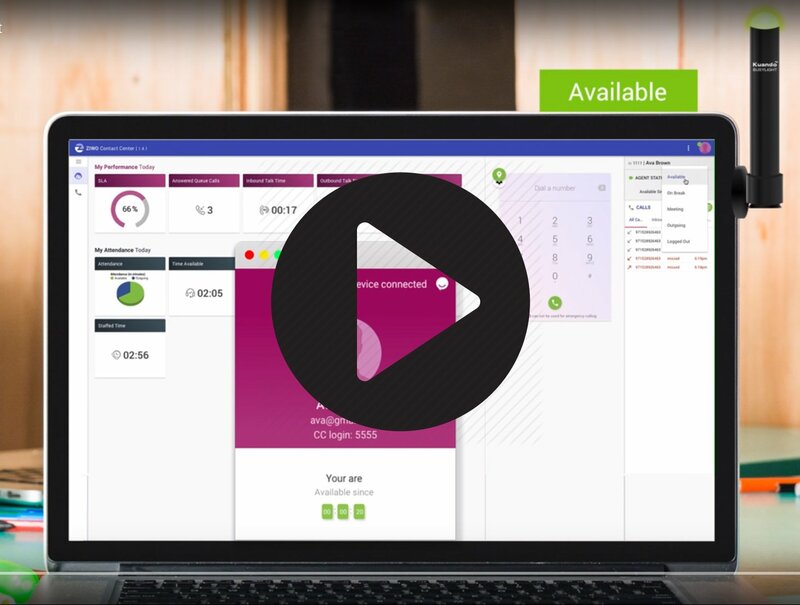 Busylight is compatible with their cti client for Alcatel-Lucent Enterprise click2dial4 and click2dial5. 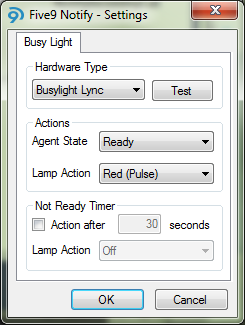 Busylight informs the user of incoming calls and messages, and lets colleagues know when a user is busy on the phone. This plug & play interoperability is provided by systel. Kuando Busylight is only responsible for the hardware. Please contact systel if you have any questions about the click2dial solution and whether your version is compatible with Busylight. 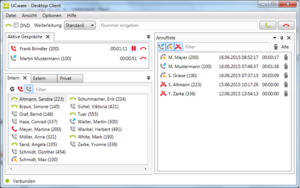 DIALit 4.3 Professional or Enterprise is plug & play compatible with Busylight UC. DIALit is a TAPI based CTI (Computer Telephony Integration Solution) published by ek-soft. 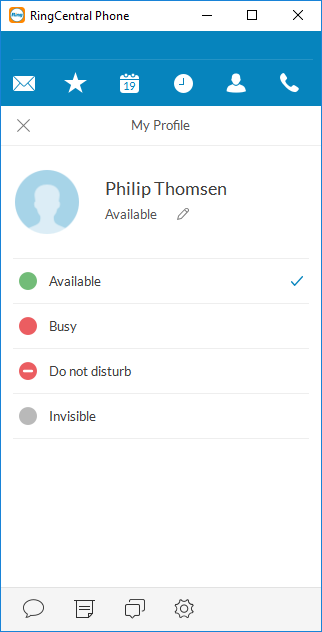 With the Busylight Interface in DIALit, everyone in the office can see now if a person is in a call, has a forwarding activated or does not want to be disturbed. This plug & play interoperability is provided by ek-soft. Kuando Busylight is only responsible for the hardware. Please contact ek-soft if you have any questions about the software and whether your version of DIALit is compatible with Busylight. Let everyone see your status. 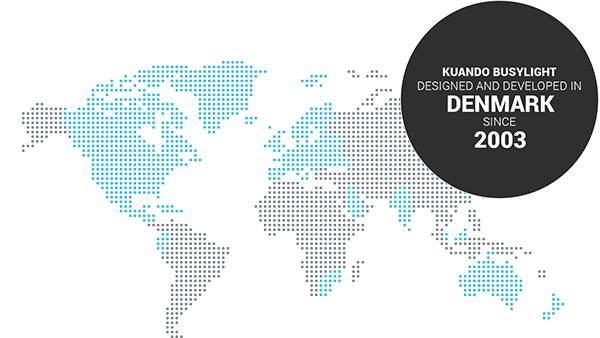 Kuando Busylight has plug & play compatibility with Dixa and is ideal for open work spaces and cubicles. Manage interruptions at work and increase workplace productivity with a busy indicator light, built-in speakers for audible call alerts and a blinking light for incoming inquiries. Five9, a leading provider of cloud contact center software, has implemented interoperability between the Five9 Virtual Contact Center (VCC) and Kuando Busylight. The solution is totally configurable in the application, so the user can set whatever color they want for a state. 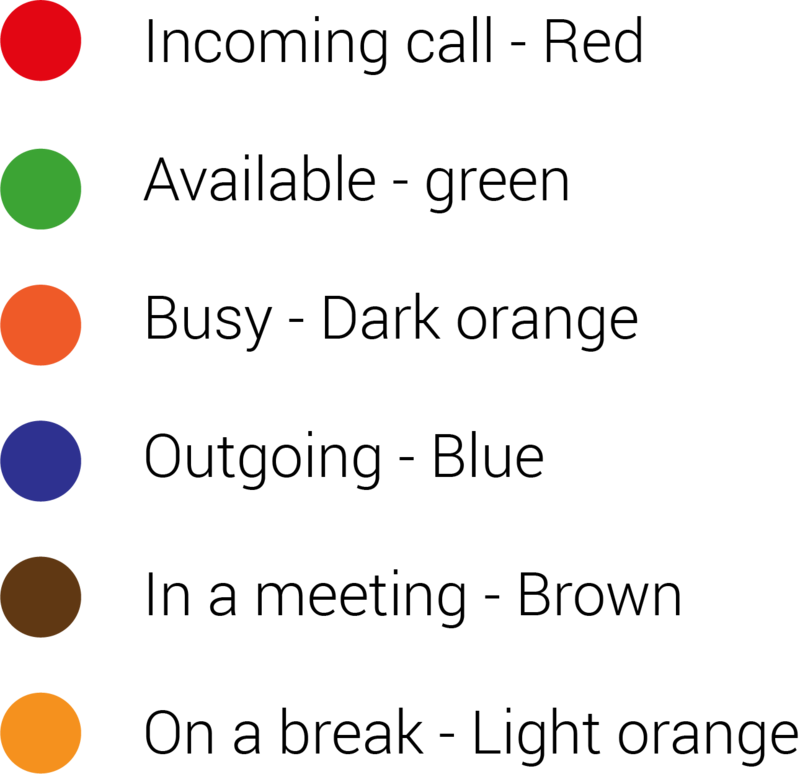 The colors supported are solid or flashing in blue, green, red, or yellow. The agent states supported are logged out, ready, not ready, on call, or other, which is any state not covered by the previous states. There are also states for custom agent codes, and they can be configured in the VCC administrator tool. 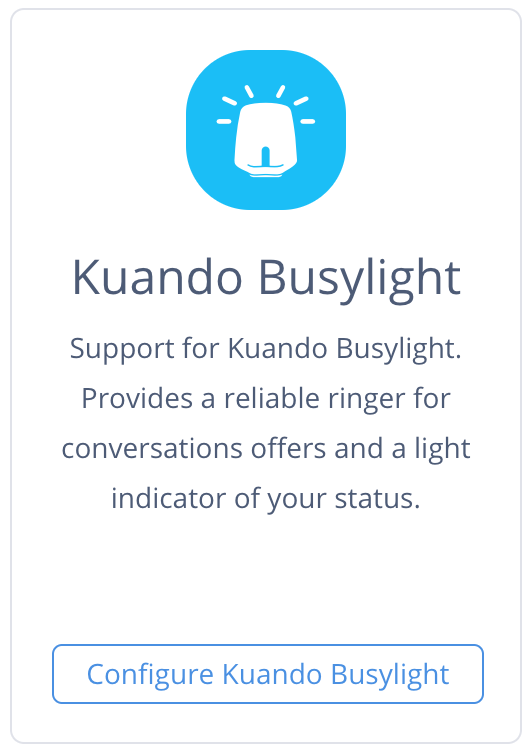 With Kuando Busylight, agents, supervisors, and managers can see if an agent is available for a conversation, busy on a call, or is in after call or other work and does not want to be disturbed. Busylight has plug&play compatibility with Go Connect, a telephony and communications solution offered by Mondago. Now everyone in the office can see, whether a colleague is available for a conversation, busy on the phone, or simply does not want to be disturbed using the integration between Go Connect and Busylight. This plug & play interoperability is provided by Go Connect. Kuando Busylight is only responsible for the hardware. Please contact Go Connect if you have any questions about the software and whether your version of Go Connect is compatible with Busylight. Mondago has implemented plug-and-play interoperability between Go Integrator and Busylight, a powerful unified communication software suite, which allows users a high level of integration, communication and collaboration with their Hosted Broadworks phone system. 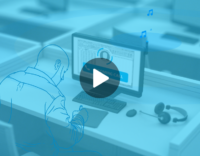 Now everyone in the office using the integration between Go Integrator and Kuando Busylight UC can see, whether a colleague is available for a conversation, busy on the phone, or simply does not want to be disturbed. This plug & play interoperability is provided by Go Integrator. Kuando Busylight is only responsible for the hardware. Please contact Go Integrator if you have any questions about the software and whether your version of Go Integrator is compatible with Busylight. IPC’s IQ/MAX® Touch is a software-driven, flexible communications device for delivering secure and compliant capabilities on the Unigy® 360 platform. IQ/MAX Touch is an intuitive and powerful tool for bringing advantages throughout your enterprise – a truly global, multi-lingual interface to connect the financial services community. The IQ/MAX Touch has integrated with the kuando Alpha and kuando Omega busy lights to broadcast users’ availability to their colleagues around them. Simply plug the USB into the back of the IQ/MAX Touch and it will sync to the users’ call status. 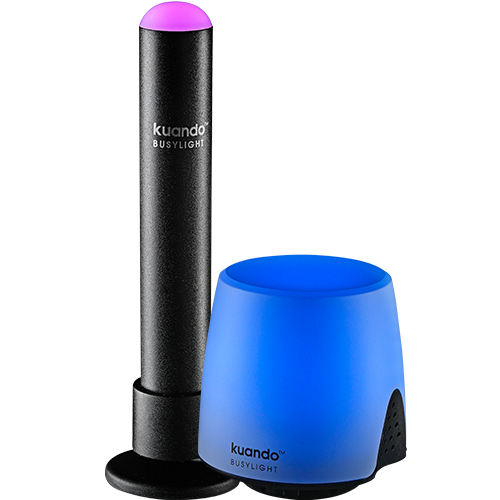 The kuando busy lights will dynamically display a red color if the user is either actively on a handset call, or actively transmitting on a speaker channel. Purchase your kuando Alpha or kuando Omega busy lights from a Plenom reseller here. For more information about IQ/MAX Touch or Unigy 360, visit https://www.ipc.com. The independent Unified Communications (UC) software vendor JoHeR has implemented plug’n’play interoperability between Metaswitch, broadsoft, Cirpack, Astrix, Communigate, enswitch, pbxnsip, sipXecs and 3CXand Kuando Busylight UC through their Voice Operator Panel (VOP) softphone. This way everyone in an office can see, whether the desired colleague is available for a conversation, busy on the phone, or simply does not want to be disturbed. You just have to plug in the Kuando Busylight UC and select it in: Settings > USB > USB light/ringer. You can select the mode in: Settings > USB > USB light/ringer mode. You can set the light brightness in: Settings > USB > USB light brightness. And you can also set the ringer volume in: Settings > USB > USB ringer volume. Two main modes are available: Receptionist or Agent, and two sub-modes are available for fine tuning. In Receptionist mode the Kuando Busylight UC is only lit when there is an incoming call or when there is a voicemail, and can be optionally lit when a call is being processed. In Agent mode the Kuando Busylight UC is always lit and can optionally flash and ring when there is an incoming ringing call. This plug & play interoperability is provided by JOHER. Kuando Busylight is only responsible for the hardware. Please contact JOHER if you have any questions about the software. Fast dial out – copy phone number and press hot key. 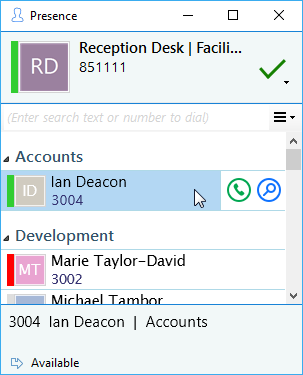 JDM Software build in the possibility to use Kuando Busylight UC in combination with the PeterConnects Attendant-console, a powerful operator-console for Cisco UC and Skype for Business. and/or sounds per different incoming call (Alarm, External or Internal). Also for the status of the phone you can have different colors (busy, idle or call on hold). We are compatible with Procall 5 and newer, Estos will not include Busylight in older software. The independent Unified Communications (UC) software vendor ESTOS has implemented plug’n’play interoperability between the latest version of ProCall Enterprise and Kuando Busylight UC. 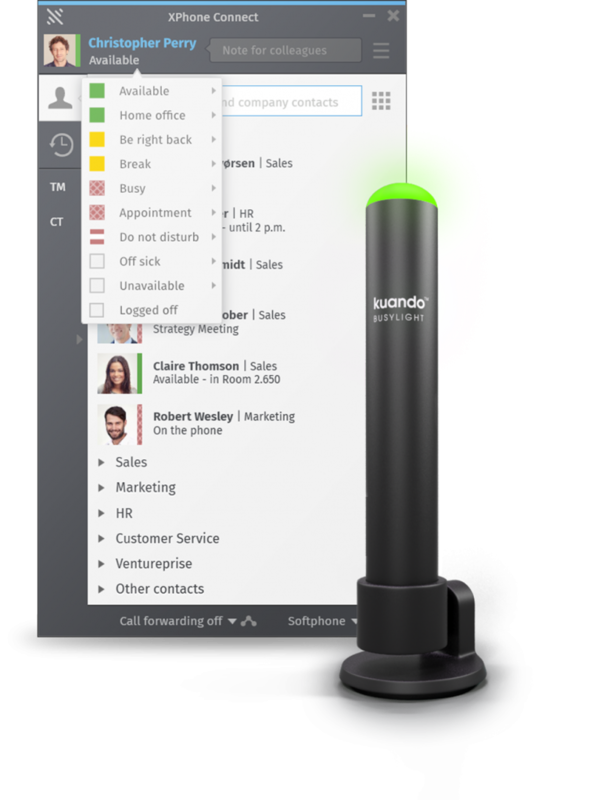 kuando Busylight UC software made by Plenom for RingCentral; a provider of global enterprise cloud communications and collaboration solutions. Now everyone in the office can physical see, whether a colleague is available for a conversation, busy on the phone, or does not want to be disturbed. STARFACE is an award-winning VoIP based telephony system that is “Made in Germany”. It integrates completely into the IT and communications infrastructure of your business, is based on open standards and can be used in Windows, Linux and Mac OS X environments. Starface has implemented plug´n´play integration for their Starface UCC Client with the Kuando Busylight UC. TANSS® is a service management solution developed for use by IT businesses and support teams. TANSS® includes an interface to connect a Kuando Busylight UC, which displays your current system status. 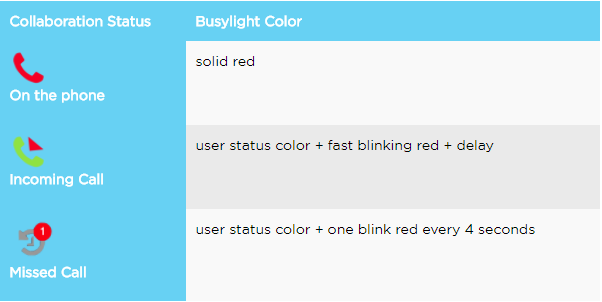 Create your own custom settings by defining the static/blinking colors you want the Busylight to show. Connect your telephone system to TANSS® and the Busylight will inform you of incoming/outgoing calls. 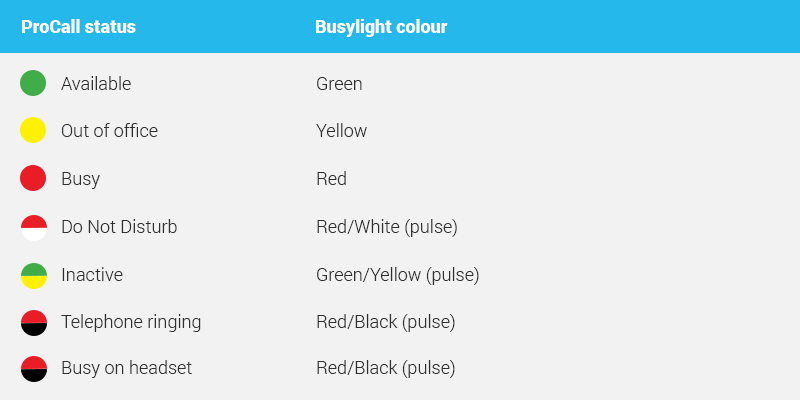 See your colleagues status without checking calendars or other Apps – just check the color of their Busylight! This plug & play interoperability is provided by TANSS. Kuando Busylight UC is only responsible for the hardware. Please contact TANSS if you have any questions about the software and whether your version of TANSS is compatible with Busylight UC. Plus Software has implemented plug&play interoperability between ucplus and Busylight, a powerful unified communication software suite, which allows users a high level of integration, communication and collaboration with a wide range of telephone systems (click here for more info). Now everyone in the office using the integration between ucplus and Kuando Busylight UC can see, whether a colleague is available for a conversation, busy on the phone, or simply does not want to be disturbed. This plug & play interoperability is provided by Plus Software. Kuando Busylight UC is only responsible for the hardware. Please contact Plus Software if you have any questions about the software and whether your version of ucplus is compatible with Busylight UC. UCware GmbH was founded as a spin-off from the Braunschweig Technology company BEL NET. The primary focus here was the establishment of a flexible and efficient communications solution that precisely represents the specific requirements and processes of the respective customer. The foundations for UCware are the highly technical expertise in the development of IP-based, cross-platform communications systems and the many years of practical experience from implementing a great variety of customer projects. With Kuando Busylight and UCware, everyone in the office can see, whether a colleague is available for a conversation, busy on the phone, or simply does not want to be disturbed. UCware Desktop Client: Microsoft Windows 7 und 8.1. This plug & play interoperability is provided by C4B. Kuando Busylight is only responsible for the hardware. Please contact C4B if you have any questions about the software and whether your version of XPhone is compatible with Busylight. 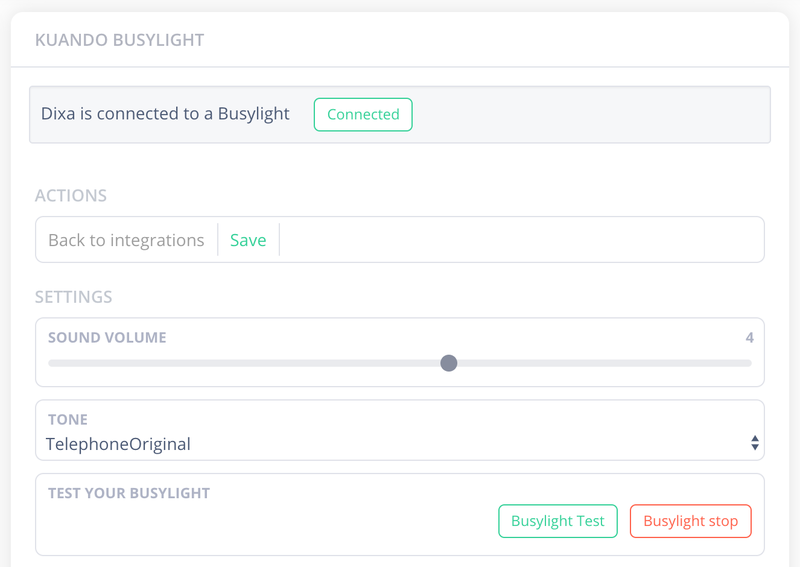 Unexus has made plug and play integration with Kuando Busylights for all Unexus Connect client software applications (contact center agent, operator, user and supervisor). Everyone in the office can see at a glance if someone is available, on the phone, busy or do not want to be disturbed. 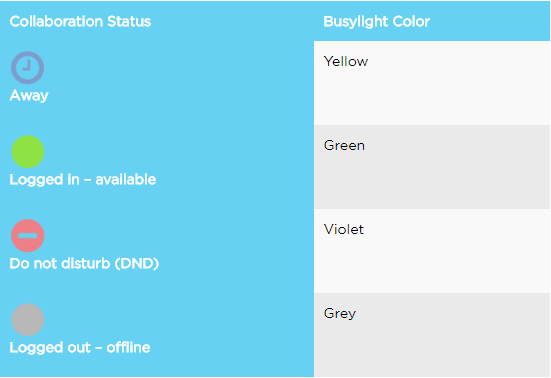 The Busylight follows automatically the user’s presence status. Kuando Busylight UC has plug&play compatibility with Wildix Collaboration—a web-based tool that enables simple, instant and secure communication between the employees from different offices of the company, from any location and using any device. Thanks to the visual presence status indicator designed by Plenom, everyone in the office can see immediately, whether a colleague is available for a conversation, busy on the phone, or does not want to be disturbed. 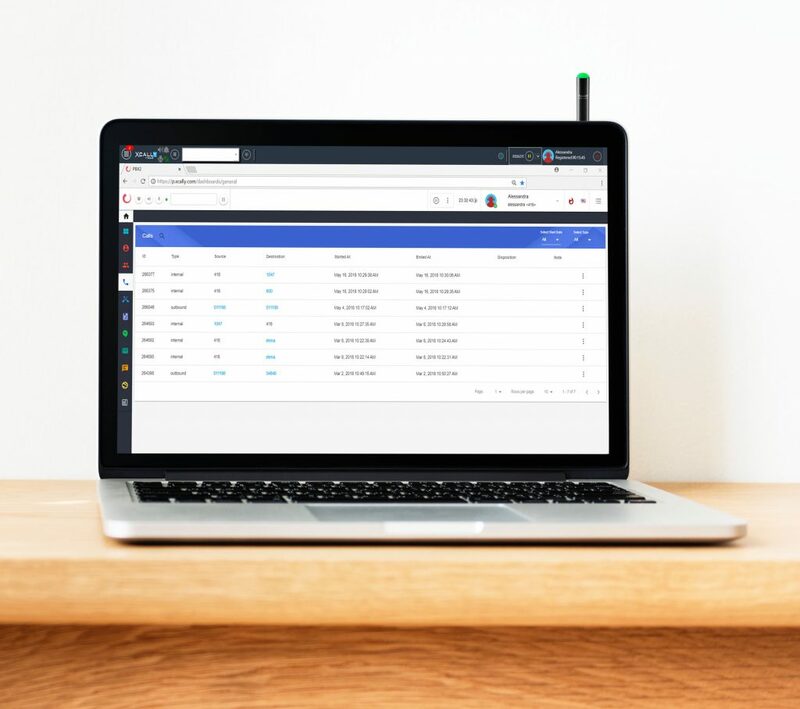 xCALLY, complete multichannel solution based on Asterisk for Inbound, Outbound and Blended Contact Centers, provides the interoperability between the xCALLY Agent Phone bar and the Busylight. Busylight has plug&play compatibility with the Xchange application, a telephony and communications solution from Samsung Electronics. Now everyone in the office can see, whether a colleague is available for a conversation, busy on the phone, or simply does not want to be disturbed using the integration between Xchange and Busylight. This plug & play interoperability is provided by the Xchange application. Kuando Busylight is only responsible for the hardware. Please contact your Samsung authorised reseller if you have any questions about the software and whether your version of Xchange software is compatible with Busylight or for general Samsung product enquiries please use the online Contact Form. 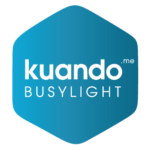 The Kuando Busylight is seamlessly integrated into XPhone Connect and visualises your current presence and availability status. 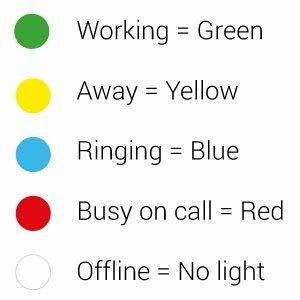 As a status-indicator, the Kuando Busylight automatically adapts its colour according to your XPhone status. This way, colleagues in your proximity know whether you are available or do not want to be disturbed. Busylight UC has plug&play compatibility with XPhone Unified Communications 2011, a telephony and communications solution offered by C4B. Now everyone in the office can see, whether a colleague is available for a conversation, busy on the phone, or simply does not want to be disturbed. 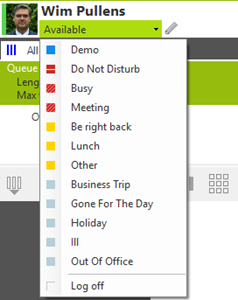 Ziwo Cloud Call Center has now made software available to integrate it with kuando Busylight. You might be attracted to its light, however, the Busylight is more than a presence indicator: it is an efficiency tool, a money- and timesaver, a quality-heightener, a staff-retainer and customer-keeper. Thus, kuando Busylight is a natural addition to Ziwo, giving it more value. Ziwo Busylight is a result of integration between Ziwo Cloud Call Center with kuando Busylight. This Plug n Play solution is preconfigured in the application, so the user can get started simply by logging in. Challenge: Call Center Supervisor, Looking for a solution to fix chaos because of unhappy agents. Solution: ZIWO Busylight is the perfect tool that provides agent status in a flash thereby improving agent productivity and creating a happier work environment. This plug & play interoperability is provided by Aswat Telecom. kuando Busylight is only responsible for the hardware. Please contact Aswat Telecom if you have any questions about the software and whether your version of Ziwo is compatible with Busylight. Connect the USB cable to your PC/Laptop/Thin Client. Plenom is a danish design and engineering company manufacturing kuando solutions to help employees working in open plan offices. We have invented the Busylight in 2003, sold globally since 2006, and we are manufacturing acoustic sound panels for noise reduction. Our sister-company, Globe Systems A/S, is an award winning headset specialist and reseller in Northern Europe, established in 1999.
you would like to test.